Looking at the 2015 LeComte Stakes: The LeComte Stakes (G3) was inaugurated in 1970 to be a race in mid-January for three-year-old colts and geldings. Since then, the race has been a decent race for getting horses to the Kentucky Derby, but has yet to produce a Kentucky Derby winner. Recent winners of the LeComte are Hard Spun, Ron the Greek, Oxbow, and Vicar’s In Trouble. Oxbow did win the 2013 Preakness Stakes and finished second in the Belmont Stakes. Ron the Greek was one of the top older males in the country before being sold to racing interests in Saudi Arabia. Hard Spun has become a very successful stallion in his relatively short stud career. Vicar’s In Trouble is a multiple graded stakes winner and is hoping to make a comeback this season after suffering an injury in the 2014 Breeders’ Cup Dirt Mile. The 71st running of the Grade III $200,000 LeComte Stakes takes place on Saturday, Jan. 17, 2015 at Fair Grounds Race Course & Slots. The 2015 LeComte Stakes has an impressive field with some nice quality colts. Headlining the LeComte Stakes include pricey Savoy Stomp and Claiborne homebred Eagle. With the LeComte being a Kentucky Derby prep race, the first four of the full field who cross the finish line first receive points toward a starting spot in the 20-horse field of the 2015 Kentucky Derby. The points are distributed in 10-4-2-1 to those top four horses. Looking at the field, there is no definite answer of who could steal those ten points. 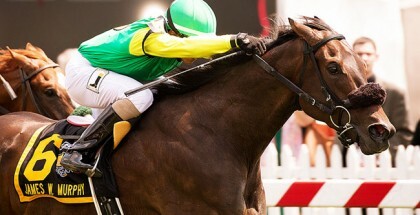 International Star: International Star showed star potential when he won his debut at Belmont going six furlongs on the turf. In his next two starts, he placed second on dirt in a listed stakes and in the With Anticipation Stakes (G2) on turf. In his third start, he won the Grey Stakes (G3) at Woodbine on the all weather. However, the colt finished well off the board in 9th in the Breeders’ Cup Juvenile Turf and then in fourth in the Kentucky Jockey Club Stakes (G2). With a pedigree consisting of Fusaichi Pegasus and a French Deputy mare, the colt should excel on any surface at any distance. Tiznow R J: After a pair of third place finishes, the son of Two-Time Breeders’ Cup Classic Tiznow finally broke his maiden at the Fair Grounds going a mile plus seventy yards. He won the race by over thirteen lengths. Trainer Steve Asmussen does know how to get horses ready for big races and for the Kentucky Derby. Can this young horse improve in the LeComte? Four Leaf Chief: Campaigned in Louisiana, this colt from the first crop of Lookin At Lucky won three of his five starts and is a stakes winner. Breaking his maiden in his first start, he advanced to win the Louisiana Cup Juvenile Stakes and the Louisiana Fantasy Stakes. His damsire is Cure the Blues, a very fast horse who descends from the Dr. Fager sire line, likely one of the fastest horses in history. Can this colt move into graded stakes company with a win? War Story: This undefeated colt will be taking the step from allowance ranks to graded stakes for the first time, and with his pedigree, he should run well. By Northern Afleet, out of the Pulpit mare Belle Watling, War Story is trained by Tom Amoss who trained Ron the Greek when he won the LeComte Stakes in 2010. In his last start on December 28, the colt did beat fellow entrant, Four Leaf Chief. Pedigree wise, the colt has what it takes, but is he ready? Hero of Humor: With the modest pedigree, Hero of Humor looks to regain the form his showed in his second start, which is when he broke his maiden. However, in five starts, he only has two finishes on the board. In his last two starts, which came in listed stakes at Gulfstream, he finished well off the board. His sire, Sharp Humor finished second to Barbaro in the Florida Derby, but was nineteenth in the Kentucky Derby. Can Hero of Humor stretch out and step up his game? Savoy Stomp: This regally bred son of Medaglia d’Oro and Crystal Current (A.P. Indy) cost Team Valor $875,000 at 2013 Fasig-Tipton Saratoga Select Yearling Sale. With a win and a third to his credit in three starts, the colt is looking for his first graded stakes win. In his only try in stakes company, he finished fifth in the G2 Nashua behind stable mate Blofeld. 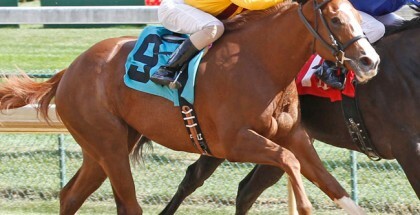 The colt should be able to stretch out and be a top contender as the races get longer. Runhappy: In his debut and only start, Runhappy made a star of himself. Breaking awkwardly and then bolting to the lead on the backstretch, the son of Super Saver wasn’t done there. On the turn for home, the colt blew it and went out to the middle of the track before pulling away from the competition, even while zigging and zagging all over the lane. Can Runhappy win a stakes that way? Probably not, but if he can improve, he could easily get the distance. Killingit: Stable mate of Runhappy, Killingit broke his maiden in his third start after finishing third and second in the races before. 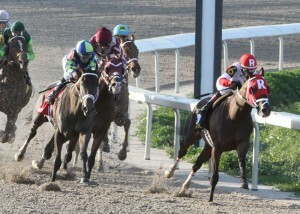 The race was a 8.5F maiden special weight on the dirt. The son of Candy Ride and the unplaced Gone West mare, Takesmybreathaway, Killingit should be able to get the distance, but can he handle the step up in competition? Dekabrist: In his first two starts, the Street Boss colt broke his maiden and won Kodiak Island Stakes at Gulfstream, but has failed to hit the board in seven subsequent starts. 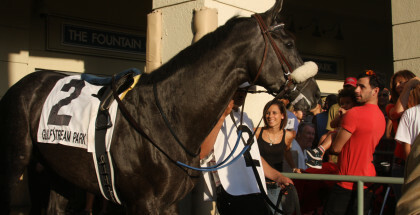 His best finishes have been a fourth in the Pasco Stakes. Likely to be the longest shot on the board, counting on Dekabrist to come in would be a mistake. Another Lemon Drop: With two starts on turf and two starts on dirt, the colt seems to have versatility that is rare to find in such young horses. All of the colt’s starts have come at a mile or longer, and has a win at 9F on the turf. With a pedigree that screams turf runner, the colt could easily surprise betters on LeComte day. Eagle: Bred and owned by Claiborne Farm, Eagle is a son of Candy Ride out of a Mineshaft mare. Needless to say, Eagle is likely to improve with added distance. Being stuck on the outside of the field could hurt the colt, but with being in the money in all of his starts, the colt should again run his race.